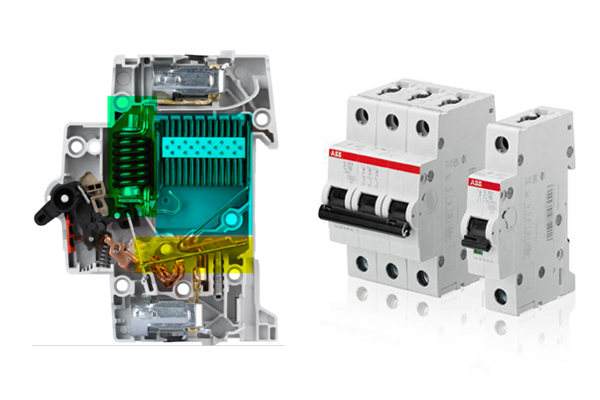 How does a miniature circuit breaker work? All electricians are familiar with them, but do they know all the details? ABB's Florian Krackhecke takes a brief excursion into the wider world of miniature circuit breakers (MCBs). Following on from my first post, 'How does a miniature circuit breaker work?’, it’s now time for a deeper dive into MCBs. This is for all those of you who were togged out in wetsuit, tank and demand valve and were disappointed last time that we only went snorkelling. Here is part 2 for experts like you! In this post, I want to limit the explanation to the tripping operation itself, so I won’t go in-depth on characteristic curves or electric arc extinction. If you want to read more about those topics? No worries—just leave a comment at the end of the post and I will organize a deeper dive next time with a decompression chamber at the ready. An MCB has various tripping mechanisms. (A) It can be switched on/off manually, (B) it can be tripped thermally and (C) it can be tripped electromagnetically. The electromagnetic and thermal tripping for short-circuit and overload protection work separately from one another. In addition, certain fitments can affect the tripping mechanism (e.g. shunt release). The manual switch is obvious and warrants no further explanation. The thermal trip mechanism functions with the help of a bimetal strip (see figure, explanation 2). As the name suggests the strip is made of two different bonded metals with different expansion coefficients, such as brass and steel. When the circuit is overloaded, the bimetal strip gets hot and one metal in the strip expands more than the other and it bends, triggering the switching mechanism (see figure, explanation 7), causing the MCB to trip. The ‘trip’ function is triggered by means of a spring-loaded accumulator. Here, the bimetal can be heated directly or indirectly and, due to its expansion coefficient, its action is time delayed. 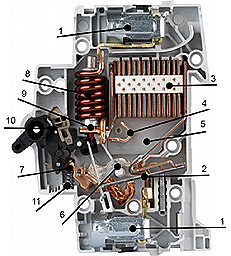 The key factor for tripping the switch mechanism of a circuit breaker is the heating—i.e., the current + time. Thermal tripping is the most common type of trip in apartment buildings. Do you remember the washing machine, dishwasher and vacuum from my first blog post? That was just one example of potential circuit overload, which would have triggered a thermal trip. Electromagnetic tripping occurs under different circumstances, for example, when a current runs from an external conductor through the metallic housing of a lamp. The low-resistance connection to the green-yellow PE conductor to the housing and thus to ‘earth’, causes an electromagnetic trip and the MCB provides protection against indirect contact in accordance with VDE 0100-410. So how does it work? Electromagnetic tripping occurs by means of what we call an impact anchor (see figure, explanations 8 and 9). The action is accelerated powerfully and quickly by magnetic forces in the direction of the movable switch contact, thus isolating the contact as quickly as possible. Further tripping is triggered by a mechanical construction that acts on the spring-loaded accumulator and resets the shift lever (see figure, explanations 6, 10 and 11). Construction and operation of an MCB: (1) busbar terminal block, (2) bimetal for overload tripping, (3) arc chamber, (4) fixed switch contact, (5) prechamber plate, (6) movable switch contact, (7) switch mechanism, (8) short-circuit tripping by electromagnetic coil that moves the impact anchor (9) so that it impacts against the movable switch contact (6), (10) mechanical component for resetting the switch lever, (11) spring-loaded accumulator. Due to our ‘trip-free’ mechanism, both the electromagnetic and thermal tripping mechanisms are active when the switch lever is blocked in the on position. This guarantees effective protection and prevents switching on when a fault is present. Unlike fuses, which can only be tested by a random sample and in doing so renders the fuse useless, every MCB undergoes a thorough functional test. MCBs are also disconnectors, which fuses, if fusible inserts are used, are not. I am glad that MCBs have been around since 1923 (patented in 1924), and that all of us today can enjoy simple electrical installation and tested protection devices, and consider their use simply a matter of course. This article was originally published on the ABB website.